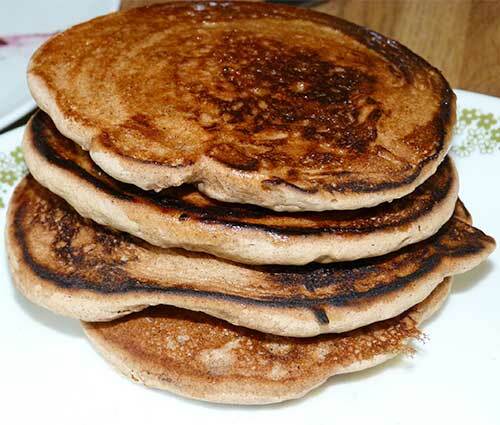 This week I’m reviewing two gluten-free pancake mixes that contain sorghum flour. Both of them were very good, and they each had a unique flavor and appeal. 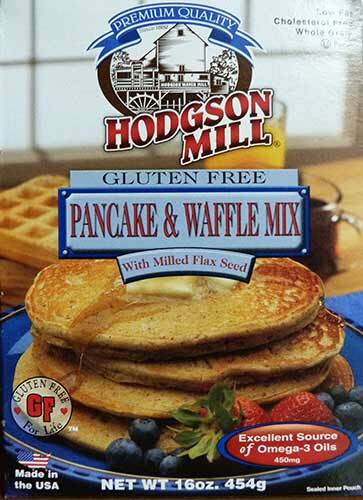 Hodgson Mills Gluten Free Pancake Mix is a whole grain, hearty mix with flax seeds. 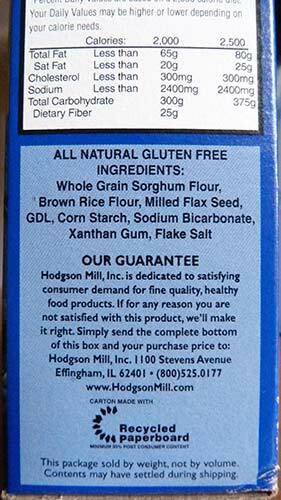 Hodgson Mill has a nice traditional design on their box with all the pertinent information. Hodgson Mill has less sugar and additives in their mix and more whole grains. 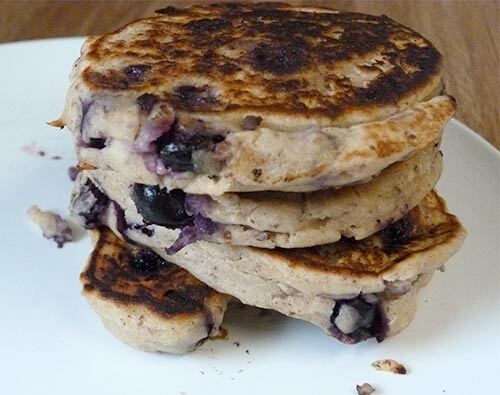 I added fresh Texas blueberries to make these pancakes extra healthy and just plain yummy. I used buttermilk and the batter came out very thick. I had to use a spoon to spread the batter out on the grill so they would be thin enough to cook completely inside. I think I would have liked them better if I had added a bit more milk to the thin out the batter. 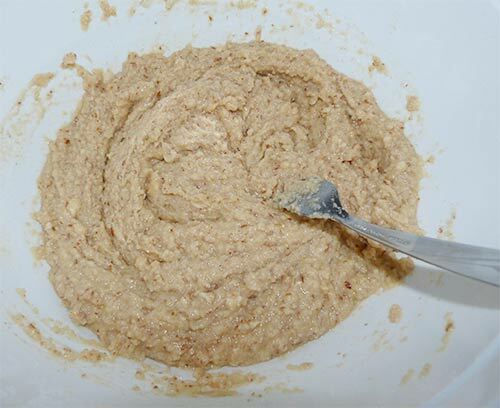 The Hodgson Mill batter was a bit thick – I should have added a little more milk. If the batter is thick, be sure to spread it out with a spoon on the griddle so the pancakes will not be to tall and cook well in the middle. Finished stack of Hodgson Mill Gluten Free blueberry pancakes. 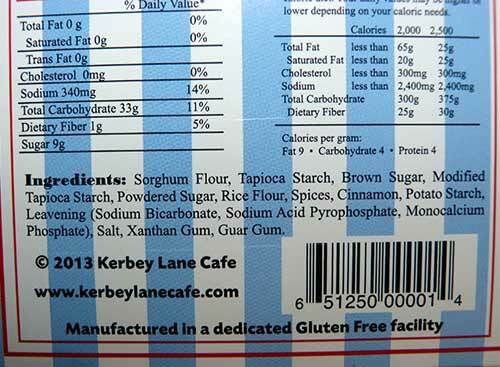 The other day I found this new gluten-free pancake mix I had never seen before – Kerbey Lane Cafe Gingerbread Pancake Mix. Kerbey Lane Cafe has several locations in the Austin, TX area. I think they’re packaging has a fun design. The package was really cute and when I turned it over to read the ingredients I was amazed to see sorghum flour was the first ingredient! Sorghum flour is listed as the first ingredient. Peace Through Pancakes – I’m all for that! 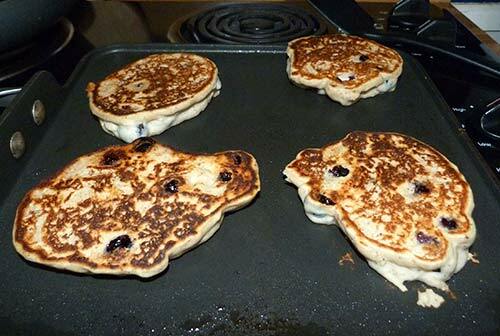 Love those flying pancakes. So, I HAD to try this, right? 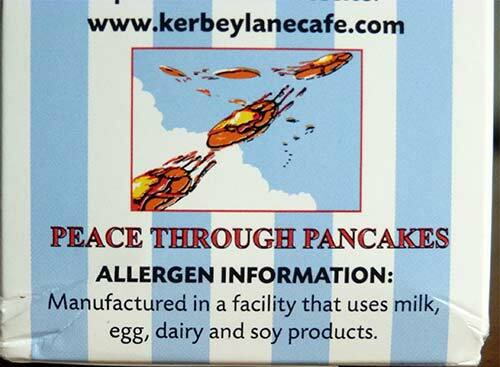 Kerbey Lane Cafe is actually a small restaurant chain in Austin, TX that also produces packaged products for retail. I found this mix at Drug Emporium. You can buy them online, too. They have regular and gluten-free mixes. The gluten-free ones are manufactured in a dedicated facility, according to the package, so that made me feel safe trying the product. The Kerbey Lane mix has everything in it, so all you have to add are eggs and water. 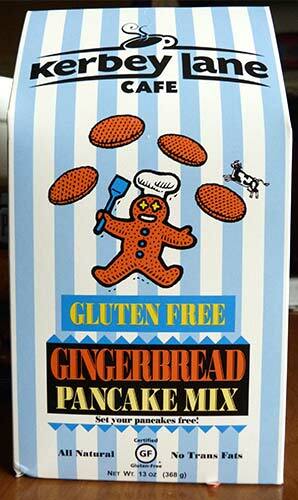 Kerbey Lane Gingerbread pancake batter. 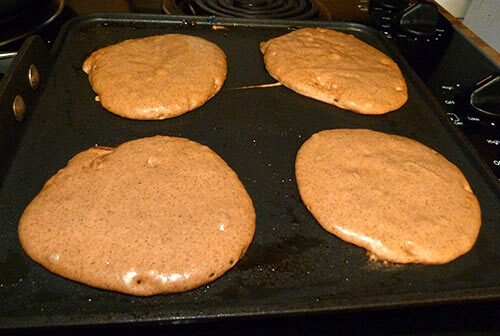 The pancakes looked and smelled like soft gingerbread cookies while they were cooking. The Kerbey Lane pancakes look like big fluffy gingerbread cookies when they are cooking. And they tasted as good as they smelled! Kerbey Lane Cafe gluten free gingerbread pancakes. I added a small amount of butter and maple syrup, but these might also be good with fruit and whipped cream. The texture was just like I remember real pancakes being. I would definitely recommend either one of these mixes to my celiac friends. 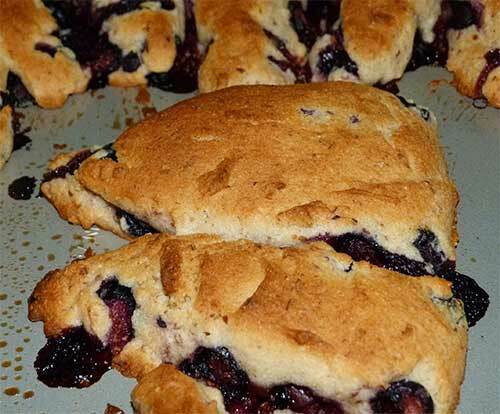 I found this recipe for blueberry scones and they looked so good I thought I’d give them a try. I used sorghum flour in place of the millet flour. I’ve never really used parchment paper for baking, but for this recipe I would recommend it. It was a bit of a challenge to get the dough out of the pie pan. I ended up lifting each slice out and reshaping them with my fingers. That’s why they are not very consistent in size, but they sure were yummy! Thoroughly sift together all dry ingredients, from millet (sorghum) flour to lemon zest. Add butter or margarine and mix with your fingers until it becomes like a crumble. Dry ingredients mixed with the butter. In another bowl, whisk together the honey, the soy milk (or cream) and the egg. 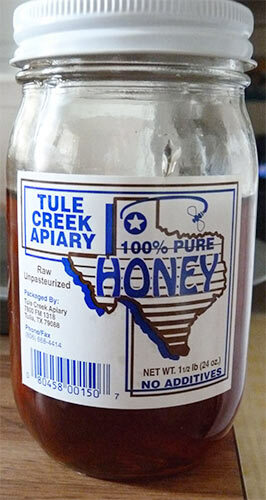 This is the honey I like to use because it is produced locally. 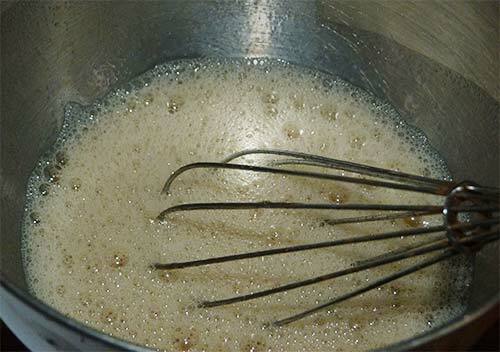 Wet ingredients mixed up with whisk. Add to dry ingredients and mix with a fork. 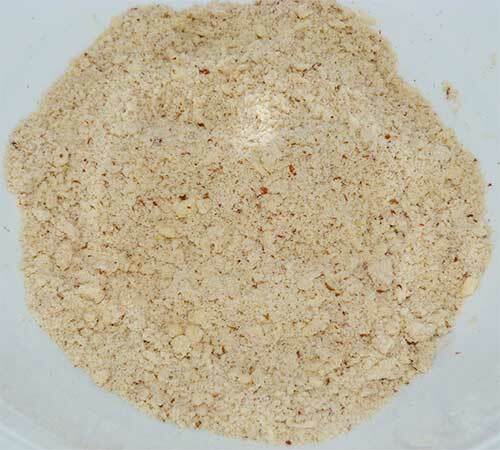 Wet and dry ingredients mixed together with a fork. 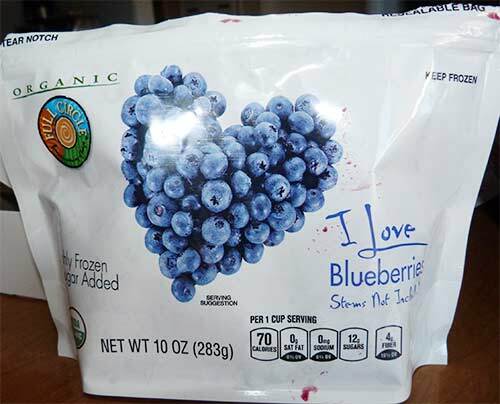 Add blueberries and mix just enough to distribute (especially if using frozen blueberries, don’t mix too much). 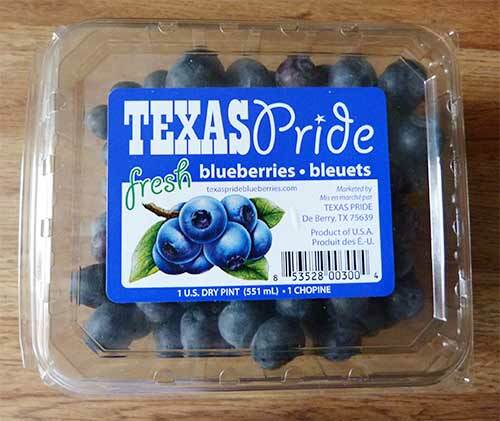 Texas blueberries are in season right now – yum! Cover a 7 inch pie pan with parchment paper. 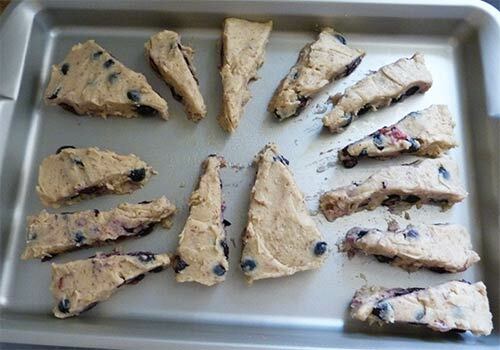 Press the scones mix into the pan and put in the freezer for 1 hour. This will make it easier for you to cut the dough into pieces before cooking. 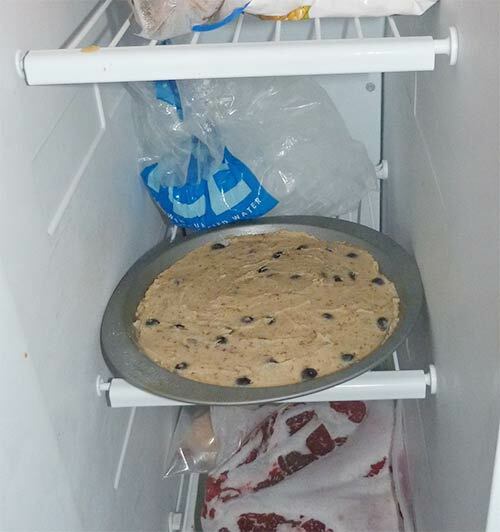 Placing the dough in the freezer for a while makes it easier to cut into slices. When you’re ready to bake your scones, preheat oven at 375F (190C). Take out the pan from the freezer. Lifting the paper, transfer the dough (with the paper) onto a large baking sheet. Using a sharp knife (you may need to pass it under cold water), section the dough into eight pieces (like a pizza) and separate one inch apart, using a pie spatula or any similar tool, so they don’t stick together when cooking. I sliced some of the slices in half so it would make more, so I ended up with more than 8 scones. 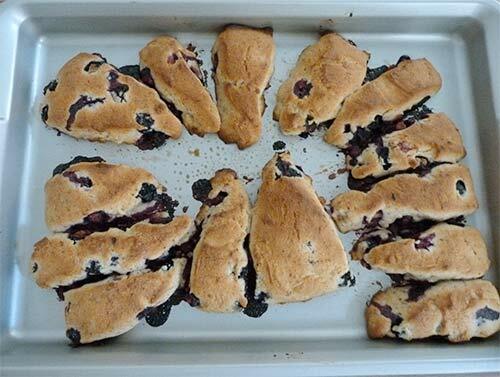 Sliced scones on baking sheet ready to cook. Bake for 20-25 minutes (start keeping an eye on them after 20 minutes). The scones baked about 23 minutes and smelled really good! 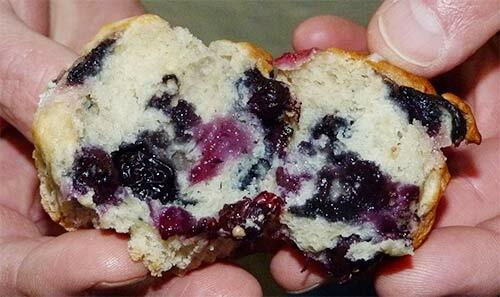 The blueberries oozed out a little, but the scones browned nicely. Bark! 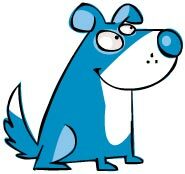 Bark Bark BARK! Don’t I have a lovely singing voice? Yes, these muffins are amazing! I made these for a meeting I was hosting and I had to try really hard not to eat all of them while they were still warm. They puffed up a lot more than I expected and were moist but not soggy. I filled the muffin cups about 1/2 full. 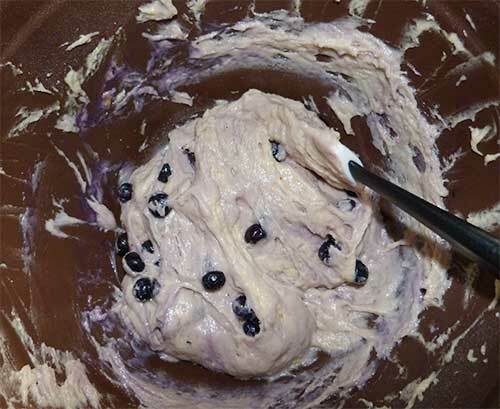 The batter is very sticky and really works your arm muscles when you stir in the blueberries. I used Full Circle frozen organic blueberries. I thawed them out in the refrigerator ahead of time. 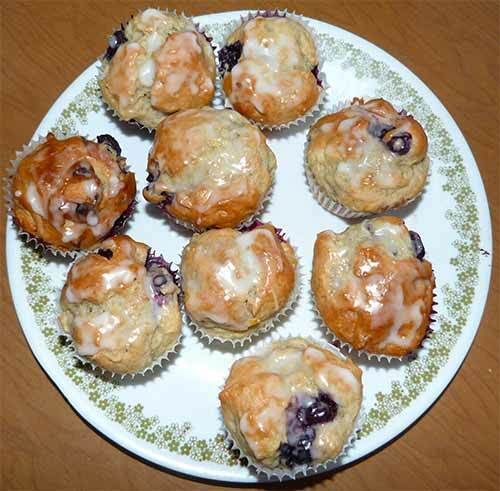 These blueberries are very big and were a really good choice for these muffins. 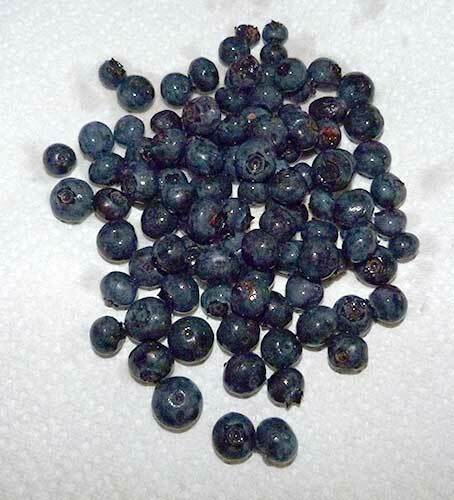 There were enough of these large blueberries to make two batches of muffins. This was one recipe that I didn’t change at all. It can be used with other flavors besides blueberry/lemon, too. Carol suggests dried cranberries with orange zest. Or, add chopped walnuts instead of blueberries and ½ teaspoon cinnamon. Have all ingredients at room temperature for best results. Preheat oven to 400ºF. Generously grease 6-cup jumbo or 12-cup standard, nonstick muffin pan or use paper liners. 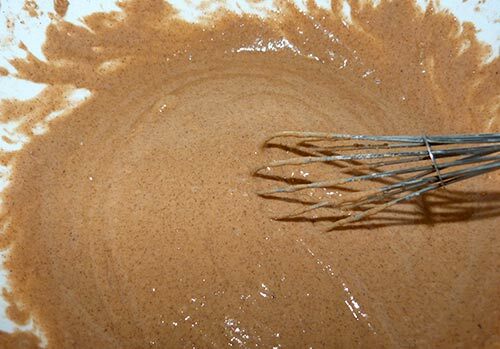 Whisk together flour blend, xanthan gum, baking powder, sugar, and salt in large mixing bowl until well blended. Add milk, oil, eggs, vanilla extract, and lemon peel and beat with electric mixer on low speed until well blended and batter starts to thicken. Gently stir in blueberries. (If blueberries are frozen, add 5 minutes baking time.) 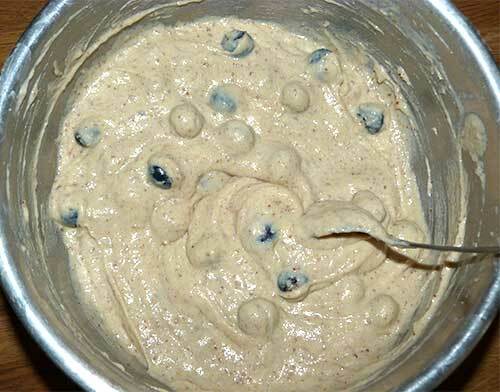 Divide dough evenly in muffin pan. Batter was very thick and sticky. Bake 6-muffin pans 35 to 40 minutes; 12-muffin pans for 20-25 minutes––or until tops of muffins are lightly browned and a toothpick inserted into the center comes out clean. Glazed muffins ready to eat. Cool muffins in pan on wire rack for 10 minutes. Remove muffins from pan and cool another 15 minutes on wire rack. Serve warm. I glazed the muffins with a light frosting made from powdered sugar mixed with lemon juice. The muffins were very moist, but not sticky, on the inside. Whisk together and store, tightly covered, in a dark, dry place. Recipe by Carol Fenster, savorypalate.com. I was ANGRY at Maizy today! She wouldn’t let me bring my bone in the house because it has dirt on it! I pouted on the back porch all afternoon, but she still didn’t let me bring it in. Dirt ISN’T bad – it’s SEASONING!